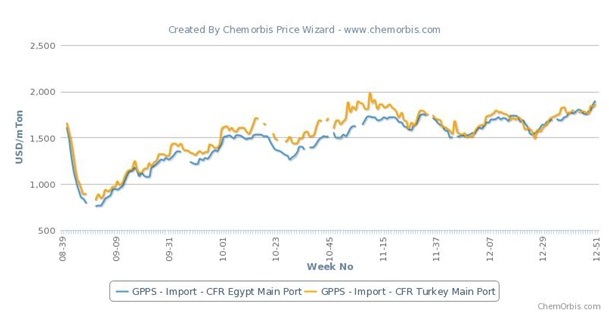 Import PS prices surpassed their 2008 levels in China, Southeast Asia and Egypt while they are at a year’s high level in Turkey, as per the pricing service of ChemOrbis. Higher styrene costs, supported by the upstream benzene market, where availability is tight, helped GPPS prices to move up in these markets. However, in Asia, despite the recent increases, producers’ offers mostly stand below their theoretical costs. Spot Asian benzene prices are $35/ton higher since the beginning of December while spot styrene costs are $75-80/ton higher. Looking at the theoretical GPPS production costs, based on current spot styrene prices, they stand $60/ton above the low end of the overall import Asian GPPS range offered to China. These bullish developments caused import market prices to move up to very high levels in several markets including Turkey, Egypt, China and Southeast Asia despite the generally weak buying interest. In Egypt, players highlight the weak demand for PS due to the ongoing political instability in the country, but they admit that ongoing increases have helped revive some demand as many think that generally limited supplies coupled with the higher dollar parity will support the increases on prices for a while longer. In Turkey, sellers revised up their offer levels considerably due to rising styrene costs and PS prices in Asia. However, done deal levels are still standing at around the low end of the overall range. Distributors complain about their higher replenishment costs. In Southeast Asia, a similar panorama was observed with producers lifting their prices on the back of the production costs. “Our customers are ordering smaller tonnages after our increases but we have no choice apart from lifting up our prices considering the current strong upstream costs,” a source from a Southeast Asian producer commented.